Definition: The Wholesale Banking refers to the provisions of banking services offered to the industrial and business entities which are rich in resources and have sound income statements. These institutes are generally the mortgage brokers, corporate houses, multinationals, government agencies, real estate investors, other banks and financial institutions. 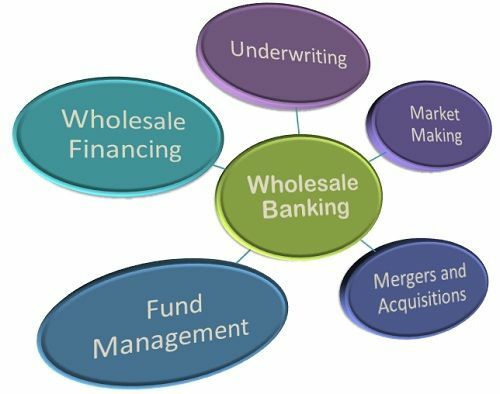 The wholesale banking comprises of the services such as Finance Wholesaling, Mergers and acquisitions, Underwriting, Market Making, Consultancy and Fund Management. The need for the wholesale banking arises because of the inadequacy of retail banking in meeting the industry requirements and a large number of financial transactions of a huge cost. The Industrial or business entities can avail several advantages from the wholesale banking such as single point of contact for all the corporate dealings whether national or international, expert recommendations, specialized products customized as per the corporate requirements, etc. Generally, the rate at which the funds are lent to the business entities is less as compared to the lending rates for an individual. This is mainly because of the huge amount and the number of transactions involved in the larger institutes.